Solomon Ternder's Blog: How I started towing the path of making a living online. So, I am a Blogger... My blog ranks page 1 on Google for a certain keyword. During service year, I was in charge of the INTERNET HOTSPOT at NCCF family house in PortHarcourt, Rivers state. At this time, I had already started my first blog and spent time learning the ropes of blogging. Around 2011, I caught a passion after my fiancee(now my wife) introduced me to M.o.r.I.n.g.a... I remember the first night I almost did not sleep just researching my new passion on Google. So I am a Researcher. 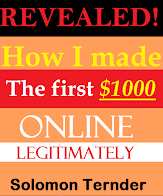 I have written two ebooks about it and now sell one and give the second free to my subscribers (blog readers). By virtue of my writings, people started contacting me many parts of the world. Some demanded for the products. That led us to start sourcing for and supplying those that request. We still do that till now. We have developed a brand around it and have settled for the m.o.r.I.n.g.a oil as our area of specialization. Now at some point the offline Jelegede business took my time and I didn't do much of the blogging online. But now that I have stopped much of the offline activities, I have resumed the online stuff proper. And who says it doesn't pay? Look, now I make money from Google AdSense, Amazon affiliate, sale of my ebooks on Gumroad, lulu, draft2digital and offline/online. By offline/online I mean Nigerians who for one reason or the other cannot pay on the platforms I mentioned above, call and request for our bank details to pay. Then they send their email addresses and we forward the ebooks to them. Now the income is passive, meaning I don't necessarily have to be actively involved. Sometimes I wake up to see purchase alerts which came in while I was sleeping. I have time to spend with God, my family and friends, which to me, is priceless. While I am spending time with God, I am not thinking about where the next meal is going to come from. Why? I have just mentioned it a while ago passive and residual income from my digital marketing efforts. Does that mean I lazy around? No! I work harder still. Why? I have just started. My counterparts in the US and elsewhere are netting $10,000 a month doing what I am doing, so I am challenged to work harder so as not to leave money on the INTERNET TABLE. Lol! The moral of this story? Identify your passion, and/or learn a skill that can make money for you, pursue it and sooner or later, you will become an Employer of labour instead of looking for jobs that you may not see. I mean, why waste years looking for job only to get frustrated after attending several interviews to no avail? Nada! Am I against those working? Not at all. The Lord bless the work of their hands(I mean their career). Only do not wait for too long if your dream job is not forth coming and start doing something. I read a book titled: LEARN IT, DO IT SELL IT. A powerful masterpiece that inspired me greatly. If you need a copy, just comment below. Business is moving online and online data room providers may be helpful in this.